Paizo puts out many supplements for the Pathfinder role Playing game every year. These tend to fall into the adventure path category which are year long adventures which release on a regular schedule. Paizo also releases a couple of books which expand on the underlying rules of the system and increase the things that players can do with Pathfinder. 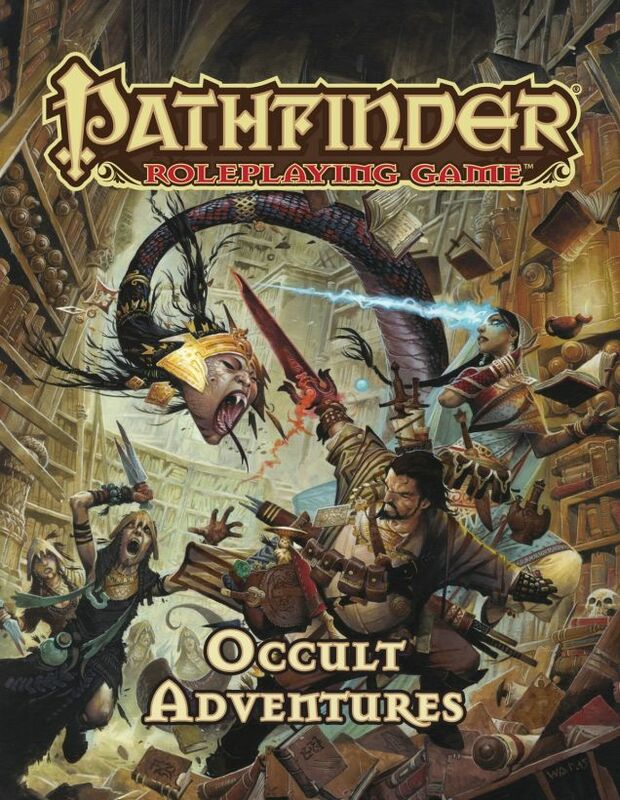 This year at Gen Con Paizo released Occult Adventures. Reading the early press releases for this book had me intrigued. They spoke of allowing players to take on the roles of psychics, Kineticist, Medium, and several other new character types. These all sounded very interesting. When I was able to get into the Vendor Hall early, I did the interview that I wanted to complete and wandered over to the Paizo booth and picked up Occult Adventures. The vision in my mind of what to expect from Occult Adventures didn’t match the reality of the book but this is not a bad thing. I envisioned psionic characters that created affects in the vein of Akira when Occult Adventures delivers psychic characters that fight hidden menaces with a much more lovecraftian feel. One of the the themes that runs through all the characters and items present within this book is power with a price. Each of the new classes has a mechanic that not only places a price on the abilities of the class but allows the player to push the power beyond it’s normal capacity by paying an even high price on the part of the character. An example would be the Medium. Their core ability is to channel the abilities of a spirit that they house within themselves for a day. They are able at give the spirit within extra influence over them in exchange for adding die to rolls throughout the day. The ultimate cost can be total loss of control of themselves for the rest of the day. Like all the Paizo products that I have picked up, Occult Adventures is gorgeous. The book is 270 pages long and full color throughout. The binding is tough and stands up to repeated use and referencing at the game table. The art work throughout the book has the iconic fantasy feel that is a highlight of Pathfinder books and a delight to just flip through and gaze upon. The books also appears to present a diverse cast of characters through it’s art. The thing that caught my eye the most was that the iconic character for the Spiritualist was Grandmotherly and I think this is the first time outside of a Wizard that I’ve seen a character of age portrayed. Occult Adventures clocks in at a retail price of $44.99 which isn’t that bad for a book of this size and production values. Occult Adventures provides the basics that a group would need to begin telling stories of this style. The new character classes are specifically designed with the themes of hidden lore and the price of power at their core. There are archetypes that allow players that don’t want to jump into the deep end of the occult to dip their toes in with a fighter or other character class build that can still partake of these types of adventures without totally abandoning what has gone before. Feats, Items, and Advice round out what is need to play in this darkened corner of the Pathfinder universe. My favorite thing about Occult Adventures is the Kineticist class. The art and mechanics of this class are definite riff on the benders from Avatar: The Last Air Bender. The design of this class makes it so that this class easily fits into an occult adventure but allows the Kineticist to just as easily join a band of regular adventurers with little to no difficulty. It just makes me happy to be able to play such a character without a lot of house-rules to make it happen. I only have one problem with the book as a whole. Despite the archetypes and advice presented throughout the book little time is spent on how to integrate character from other books into these types of adventures. It also assumes that the group will already be interested in this time of game and spends little time in helping a new game master learn how to sell this type of game to his players. It is a minor quibble but something that would be a good addition to something with such a strong theme that runs throughout both the mechanics and stories. I give Pathfinder: Occult Adventures four bear paws out of four. It provides a all one needs in order to run adventures in the Pathfinder universe. It has gorgeous art, a good price point , and carries the themes throughout the book. 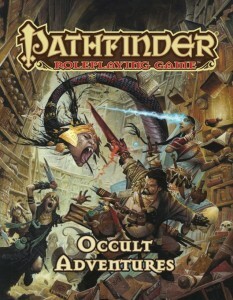 If you are a fan of Pathfinder, this a must-have for your collection. The book that got me hooked. When I was at Gen Con this year, I made sure to swing by the Cubicle 7 booth. 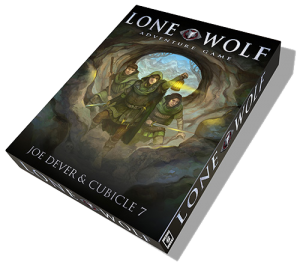 I had checked them out last year and they were going to do a Kickstarter for the Lone Wolf Adventure Game. 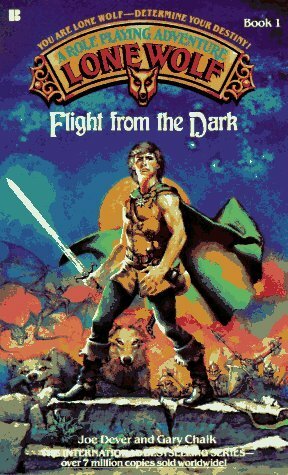 I loved the Lone Wolf Choose Your Own Adventure books when I was young and I had always thought that the world would make an excellent role playing game and setting. It was a good thing I did as Cubicle 7 had successfully Kickstarted the game and several box sets available for purchase at their booth. I initially put the box set down and wandered off because this was the beginner’s box for all intents and purposes. I had become accustomed to buying the core books of a game and doing everything on my own so I did not think that this version of the game would be for me. After a bit of wandering through the dealer hall, I ended up back at the Cubicle 7 booth and picked up the game. My love for Lone Wolf won out. 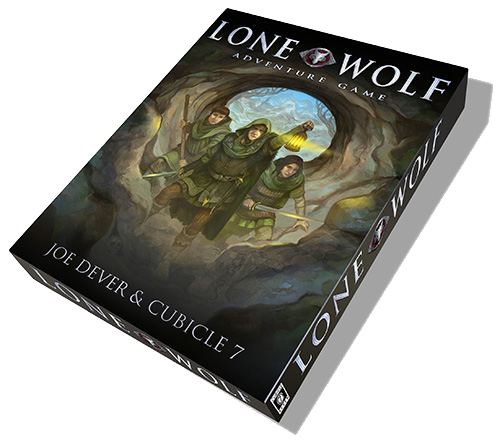 The Lone Wolf Adventure Game lists at $29.99. There is a lot in the box for that price. First, it is a gorgeous product. The box is sturdy and glossy which made it a tactile delight. The books are all full color and are bound well for books of this type. The three books included in the box are the Book of Kai Training, Book of Kai Wisdom, and the Book of Kai Legends. 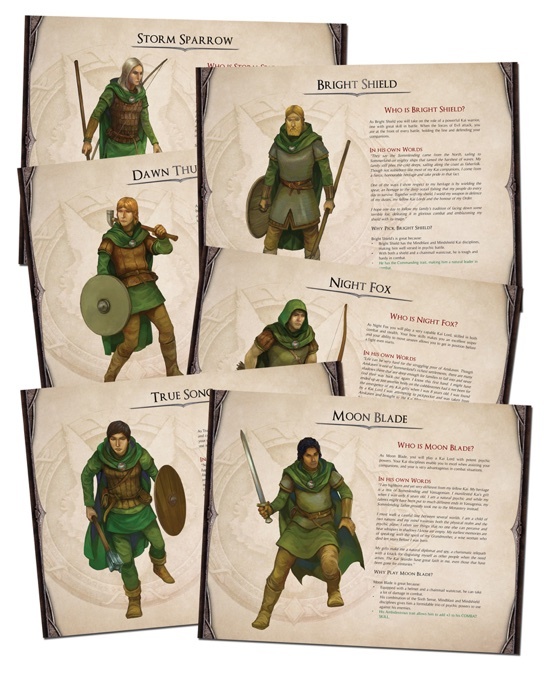 It also includes 6 full color pre-generated characters to get started quickly, a map of Summerlund, an equipment guide, extra character sheets, and tokens for playing the game. It also comes with a flyer entitled Read This First which gets a beginner to the game started on the right foot. 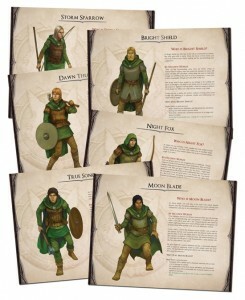 The introduction flyer quickly explains the basics of a role playing game and the rules of Lone Wolf Adventure game and then directs the new Narrator to pick up the Book of Kai Legends. The first adventures listed in the book provide a tutorial both on how to play and run the game. In about fifteen minutes time a groups of seven people could be up and play thing first adventure. The six pre-generated characters are done so that they provide a nice balanced group with some overlap to help ease the sting of failure is things go wrong in the random number generation sense. The system is fairly straight forward. For things non-combat oriented, you either use the random number chart and drop your token onto it. If the number is six or better you succeed. Combat is handled just slightly differently. You would compare your character’s combat value to that of the one you are fighting to get a combat ratio. a random number is generated and a chart is consulted to show how much endurance each individual lost. Like I said, easy. The game, just like the books, starts you as playing a member of the Kai order. You are initiates starting out on your first adventure. The characters you get to choose from each have a set of Kai Disciplines that are taken straight from the book. These Disciplines range from Mind blast, which gives a bonus to combat to those undefended, to Hunt Mastery which allows the Kai to never go hungry when out in the world. If you are not coming to game filled with nostalgia, there is enough information presented in the Book of Wisdom to bring the world to life in your mind to create new adventures after you have completed the ones presented in the Book of Kai Legends. I like the Lone Wolf Adventure Game quite a lot. It captures the feel of the original books well. It adapts the world to a table top role playing game in a simple fashion that is easily made more complex by adding the master rules presented through out the book. It also does an excellent job of taking something that you did alone and translating it into a group effort. The production values for the box are high with full color throughout and nicely done character sheets for when you start making your own. My one issue is that the box set could have done with a little more diverse art work. The Kai include woman in their ranks and the pre-generated characters could have had more females in the mix and as well as throughout the books themselves. I give Lone Wolf Adventure Game three bear paws out of four. It is a good game that easy to understand and quick to get into. My need for a book with all the rules I want at the beginning is the one thing that keeps me from giving it a 4 out of 4. It is an excellent addition to an role player’s shelf. One of the things that is near and dear to my hear are superheroes. I remember as a child saving up money to run down to the corner store to buy X-Men, Green Lantern, Dr. Fate, and Dr. Strange off the spin rack. I would run home to sit on the porch and read them and then put them in a box to be re-read at a later date. My collection of table top role playing games includes a large variety of games that allows one to take on the guise of a superhero as well. The problem with mainstream comics is that you can not find a title that has a gay superhero or a gay superhero that is a bear. Sure, DC has Green Lantern in Earth 2 Society but they have taken him from a major player to a representative of life which renders him being gay a moot point. Also, not a bear. Luckily the internet has answers to these questions. 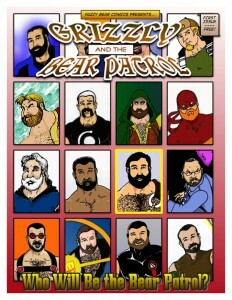 Grizzly & The Bear Patrol is a web published comic. Unlike other web comics, this isn’t published in a strip fashion but in issues. There are currently 17 issues available for reading on the site and an 18th issue currently in the works. I love this comic. The art and stories remind me of Wolfman and Perez era Teen Titans with a blend of the humor that could be found in the Legion of Substitute Heroes. One of the characters is a bearish version Color Kid from the Legion of Substitute heroes who happened to be my favorite member of that group. So, I was pretty much sold from issue one. The first issue introduces the reader to the denizens of Bruin city and the various heroes that reside there. The title character Grizzly, is very much a Superman analog. We also get to meet Polar Bear, Echo, Red Beard, and Color Cub. These scattered heroes must come together to defeat the fearsome Bear Collector. The following issues provide insight and background to the characters as well as providing new fearsome and campy foes. The time between issue can be great. The creator of Grizzly & The Bear Patrol does everything by hand this is a labor of love on his part. This is the only down side of the comic to me as I have to wait so long to see the next one. 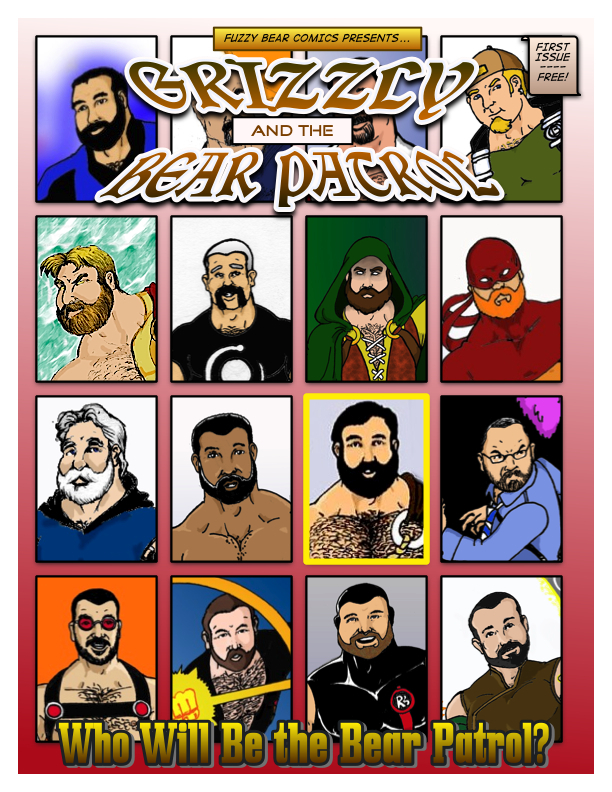 If you like bears and superheroes, Grizzly & The Bear Patrol is a must visit webcomic. I give it four bear paws out of four rating. Well worth your time to read. I was not a fan of the first movie. I seem to recall watching and thinking that I would not be upset if none of these people made it out alive. It wasn’t boring. I just wasn’t able to connect with any of the characters in any meaningful way. Which I get, as I am not the target audience for the first movie or this movie for that matter. 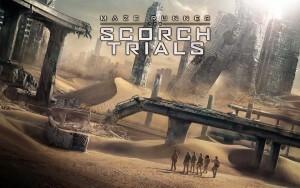 So, I was going into The Scorch Trials biased, which one knows always affects the outcome of an trial. Maze Runner: The Scorch Trials begins where where the last move left off. Our experimental lab rats have been rescued from the horrible maze created by WCKD and are being given food, clothing, and medical care by their erstwhile saviors. Thomas and the other refugees from The Glade discover that theirs was not the only maze in existence. There were several others and the teenagers from those mazes are here as well. It is through meeting with the loner of this new group of teenagers, Eris, that Thomas learns that all is not what it seems in this new paradise. The people that leave to the farm aren’t going to a better place. They are being turned into human vaccine manufacturing plants. Thomas and Eris also discover that there is a rebellion force that is hiding out in the mountains and they plan their escape to try and reach this one source of hope. What follows is a grand escape sequence with requisite slowly closing blast door. A flight into the night to discover a desiccated world populated with toxic zombies and humans that are creating new societies through whatever means necessary. I will admit, I was entertained. I won’t say that Maze Runner: The Scorch Trials is a good movie but it is a better movie than the first. The visuals of the movie are gorgeous. The storm sequence as the group discovers the hard nosed trader’s city was well rendered and the blasted cityscapes that the wander through are engrossing to look upon. The acting in the movie is passable. The point of the story is escape and survival, there is little character development that takes place. Thomas and the lost boys and girl react appropriately to the various trials put before them. The villains of the piece are stock and twirl their mustaches for effect but there is little else for them to do then be “the villain”. Maze Runner: The Scorch Trials gives the audience almost all the tropes of the post apocalyptic genre. There are decimated cities, creepy yet fast zombies, rag-tag bands of freedom fighters, hard-nosed traders protecting their families, and burnt out manipulators who have given up hope in this time of despair. My particular favorite isn’t really a post-apocalyptic trope but the lie that adults tell children when their pets die. While at the rescue center, the survivors are told that some of them will get to go to the farm where they will be safe. Names are called and teenagers are trooped out the door, never be seen again. I had to choke back laughter as nobody else was laughing at hilarity of this. This movie also makes me realize that I would be kind of horrible in a post apocalyptic scenario. Spoiler warning on. There is a scene towards the end of the movie where Thomas’s love interest is standing on an outcropping looking into the mountains after the group has found the rebel band. Thomas asks her what is wrong and she begins apologizing before explaining that she has given up their location to WCKD. Thomas scurries off in an attempt to warn everyone of the impending assault. My one thought at this point in the movie is that he should have pulled a “This is Sparta!” and kicked her off the mountain. I know, I’m horrible. Her surprising but inevitable betrayal was not surprising though. I knew it was going to happen as soon as they rescued her. I would give Maze Runner: The Scorch Trials one bear paw out of four. I was entertained while watching it and enjoyed punching at it while walking to dinner. I won’t be able to recall much about it in a few days. If you are a fan of the books or the first movie, definitely make sure to see it in the theater for the pretty visuals. If not, give it a pass or watch it when it hits Netflix. I am a fan of Lilith Saintcrow’s writing. She has done a series entitled the Bannon and Clare Affairs. They are a mix of Sherlock Holmes, Steampunk, and urban fantasy melded with a deft touch. I was perusing the local book store when I saw that she had a new book out entitled Trailer Park Fae. I was intrigued. Urban fantasy shies away from the southern edge of Americana and avoids this particular wrong side of the tracks like the plague. I pondered how these two disparate ideas would come together and picked up the book because I was excited to see how Saintcrow pulled it off. The story opens with a vignette that calls out to any whom have read A Midsummer Night’s Dream. The Queen of the summer court is wandering towards a meeting. She is spied upon by Robin Goodfellow with whom she is to meet. The reader is treated to Robin’s thoughts on the affairs of the sidhe and how much like the mortals they disdained they were but with a longer outlook. Here, the gentle reader is introduced to a mystery. It appears that the Queen of summer has struck a deal with Puck for the creation of something and that a cure has been found as well. Like everything with the fae, the truth is clouded and hidden behind shadows and gambits which require time to unfurl. These secrets unfurl as our two protagonist take their turns upon the stage. Both are outcasts in their ways. Both have lost much but stand to lose even more still with very little to gain. Jeremiah Gallow, our titular trailer park fae, struggles with a mortal life that has lost it’s anchor. He plays at being a construction worker but the future without his wife has left him hollow and dreaming of some easing of this pain. His carefully constructed illusion comes crashing down when a woman on the run from Unseelie comes crashing into his life dragging a deep buried past and secrets he never knew out into the open. This woman, Robin, is a member of the court of the Lady of Summer. A child is being held over her head to coerce her participation in the dark deeds that are beginning to spin out of control. Her voice is her only weapon and it is one that comes with a heavy price. She, too, longs for a surcease to her travails as she sees enemies in every shadow. Saintcrow crafts a tale of wonder out of the ordinary places of life. She captures the magic that comes with any fairy tale and deftly weaves into the hidden places that everyone takes for granted. There is a scene where Robin is returning to Jeremiah’s trailer and the dark streets harbor a menace that is palpable but the magical innocence of a child provides a spark of color and relief from anxiety that had built up to this point in the book. Saintcrow does not shy away from the problems that can be found in these places either. Robin in her past and Jeremiah now face the infidelities, the domestic violence, the struggle to get by with not enough and the need to just escape as part and parcel of their existence. Jeremiah and Robin are both characters of depth which I found refreshing in the urban fantasy genre. They are heroes of clay with their own problems and aspirations which makes them both more approachable. The mystery that unfolds and how the book ends takes the tropes of fairy tales and urban fantasy and gives them a tweak that makes Trailer Parker Fae a refreshing read. I would give Trailer Park Fae three out of four Bear paws. An excellent book that delivers on it’s promises. Well worth picking up and reading with a nice hot cup of hot chocolate or a pumpkin spice latte. Okay, I am a little late to the game. 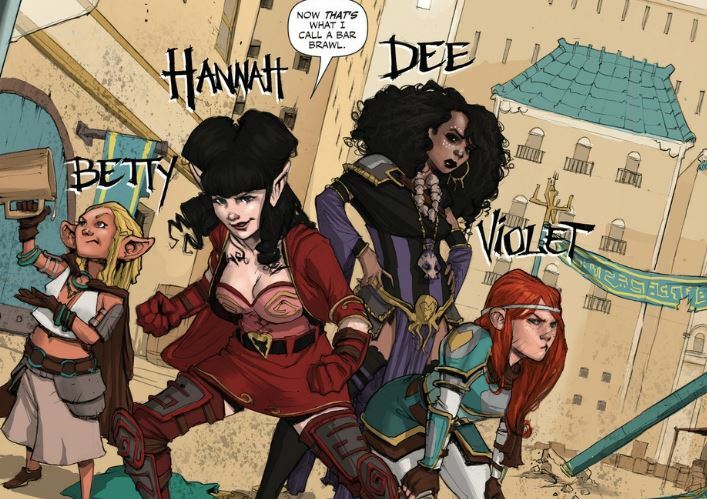 I just recently discovered the book Rat Queens by Wiebe and Upchurch and I have to say I am sad that I missed this book when it first started coming out. Sass and Sorcery collects the first five issues of Rat Queens. Rat Queens tells the story of an fantasy adventuring band composed of women from several different walks of life who’s life’s paths have led them to joining the group. Dee is an atheistic cleric that comes from a family cthulhu-like monster worshipers. Betty is a halfling thief with a penchant for recreational alchemy and candy. Hannah is an elven mage with an attitude and overprotective parents who also happen to be necromancers. 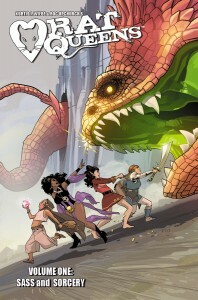 The final member of the Rat Queens is Violet. Violet is a dwarf for whom hipster is an art form. She shaved her beard before it was cool and constantly works on her battle cries. In Sass and Sorcery, the intrepid Rat Queens are settled in to celebrate another successful venture. The only down side is that their celebrates had deleterious side effects on the town in which the live. With the rising of the sun, the Queens and several other adventuring bands discover themselves in the town’s jail facing the consequences of their destructive debauchery. The Rat Queens, along with the other adventuring parties that they dragged into the celebrations, must either complete a service for the city or be forever banished. The assignments given all sound quite simple and something that none of the groups should have any difficulty handling. This assumption is far from the truth as several adventuring groups are met by assassins and traps that either kills the group out right or leave few survivors. It is up to Rat Queens to figure out what is going on and save the city from the darkness waiting to engulf it. There is a lot to love about this book. The art is gorgeous. Upchurch does an excellent job oat creating characters and scenes that are a joy to behold. He has no difficulty switching from scenes of dialogue to full scale battles. Each are treated with love that shines from the page. Wiebe’s characters are also well crafted. My favorite being Dee. I particularly like her because of how Wiebe treats her. She is an atheist cleric that has left her family over her beliefs. Her family are staunch believers in their lovecraftian god but still love their daughter despite these differences. It is refreshing to see this type of connection in the fantasy genre and Wiebe handles it well. 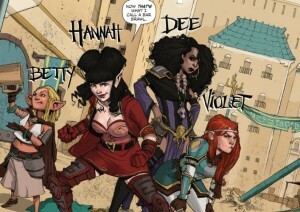 Rat Queens also provides a diverse cast of characters which is something that was exciting. An adventuring party composed of women is virtually unheard of and that they are well rounded characters that you want t o know more about is just icing on the cake. Both the main characters and supporting characters cover the spectrum to present diverse characters as just people that have stories that are worth telling. I have to give Rat Queens Volume 1: Sass and Sorcery four bear paws out of four. The story is excellent, the characters are interesting, and there are plenty of threads that make me want to pick up the next volume of this book. If you like comics and the fantasy genre, this trade is a must have for your shelf. I was wandering through a book tore the other day when something caught my eye. 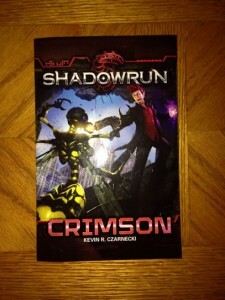 The book had Shadowrun emblazoned across the top and the lurid title of Crimson. It had been quite some time since I had seen a Shadowrun novel and just had to pick it up and see what it was about. The back blurb told me all I needed to know. The main character Rick “Red” Lang is a vampire mage who has just awakened from torpor to discover things have changed in twelve years. There is something you should know about me. I am a simple creature. If it has vampires, werewolves, or magic, I am likely to give it a chance. If it has two or more of these things, I’m sold. The addition of the Shadowrun setting just makes it very unlikely that I will be burned for this predilection. The hero of our story begins at the top of his game. He is a high powered mage with the toughness and immortality of a vampire. He runs in the rarified circles of the elite in the shadows. A job for the leader of the Yellow Lotus Triad ends up bringing more heat than anticipated and Red needs to spend some time off the radar. Little did he know that a little time was going to be twelve years. The story of Crimson is two fold. The main thrust is the mystery of why Red lost so much time and what is going on in the underbelly of the ruins of Chicago. The other plot plays with the ideas of identity and an oppressed minority. As Red discovers what happened to cost him so much time, we learn that he traveled to Chicago to repay a debt to a friend who is a ghoul. Here is where a little Shadowrun knowledge helps. In Shadowrun, Ghouls and Vampires are all products of a virus that changes them. Vampires are high functioning and capable of passing in normal society. Their feeding habits are seen as minor problems that are solvable through donation.Ghouls, on the other hand tend to be low functioning to feral and feed on the flesh of humans. There are Ghouls that are high functioning but this does not change their dietary needs and thus they are hunted and persecuted regardless of intelligence level. Red came to Chicago to help a friend who had organized and enclave of ghouls both feral and high functioning. He was there to help them create a better life for themselves before he taken out of commission. This is where identity and minority come into play. Red has been gone for over twelve years and believed to be dead. When he returns, thins have changed dramatically. There was technological crash in which he lost everything as he was not there to defend his holding. His magical abilities atrophied after such a long time without use. His contacts had dried up outside of those who knew his true nature, which included the ghouls. The divide between Red and the ghouls is apparent. one of the ghouls, Needles, has underwent massive body sculpting to make her look more like a normal human. She has to struggle everyday to act normal, fit in, wear the mask. Czarnecki lets us watch as Red struggles to understand why she looks at Red with such disdain. He is able to stride out into the world with little to know repercussions whereas she had to take up so many of the enclaves resources to make her capable of doing the same thing. The story unfolds around the mystery but it feels much more like the secondary story to watching Red come to understand his place outside of the mainstream and still being able to be a part of with very little effort. I will admit that Crimson is not a deep mediation on these themes. This does not diminish the fact that it does try to tackle the subject matter though. In the arena of game fiction, light plot filled with fan service is the norm and that Crimson takes the time to deal with identity and oppressed minority is something nice to see. I would give Crimson three bear paws out of four. A nice Shadowrun story that deals with deeper issues than expected. Crimson is Czarnecki’s debut novel and it makes me hope that we see more from him. I liked how he handled these deeper themes and want to see how he handles similar topics as his voice matures.